Are you looking for the perfect way to define your outdoor space? Then consider a pergola. When posed the question of what is a pergola, most people are likely to respond that it’s a structure that provides shade. But a pergola does so much more than simply provide shade. It’s also a beautiful way to provide a garden focal point while creating a destination for family and friends. For a detailed guide on how to make the most of a pergola keep reading this article. So, Just What Is a Pergola? Simply put, a pergola is an outdoor structure that consists of posts which support an open roofing grid of beams and rafters. The posts and lattice ceiling of a pergola are sometimes used to support climbing plants — particularly in situations where people are seeking more organic shade. And that’s why pergolas are often confused with arbors. Arbors are smaller, simpler, free-standing archways with curved arches and maybe a bench seat. Pergolas, on the other hand, are larger than arbors. They’re typically flat, open in structure, and are often attached to homes, buildings or even built on a deck, but can be freestanding as well to create a focal point in your yard or to create shade in a pool area or other outdoor space. If you love entertaining outdoors, but don’t want to be on display, a pergola is versatile enough to provide privacy. Even though it’s an open structure, you can create privacy by merely hanging drapes, screens or even latticework to one or two sides of the pergola. Installing a pergola is a great way to add garden space to your outdoor area. You can create a natural ceiling of intertwining climbing plants like clematis, jasmine, wisteria, and ivy. Then hang plants from the boards to create a garden in the air. A pergola adds a lot of beauty and interest to your outdoor space. And this is a huge selling point if it ever comes time to sell your home. Any realtor will tell you that adding attractive landscaping to your home is going to increase your home’s value. And since even a high-quality pergola is still affordable, you’ll get a great return on investment. Is a Pergola Easy to Build? While you could opt for a pre-fabricated kit, you’re going to have a much higher-quality and longer-lasting structure if you get one professionally installed. 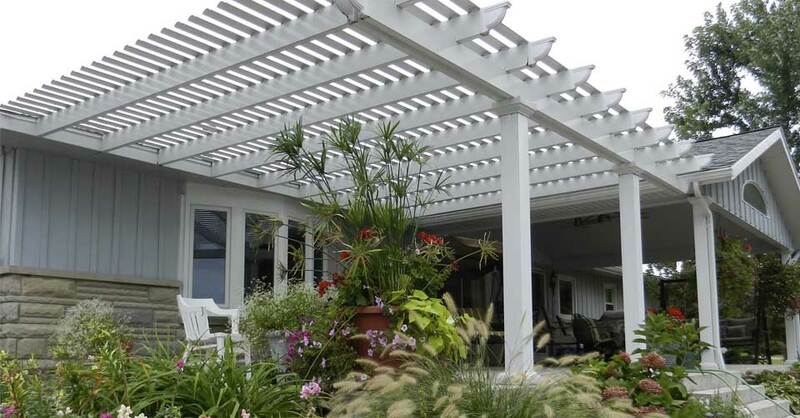 And while pergolas are available in a variety of materials, stick with something like extruded aluminum. It’s incredibly durable and maintenance-free. Your best bet is to work with a company that both sells and installs pergolas. Since the installers work for that same company all the time, they’re familiar with the product and can deliver on consistency and quality. They’ll also put your best interests first. Now that you can more easily answer the question of what is a pergola, it might be time to add one of these gorgeous structures to your outdoor space. And if you have questions about what might be the right pergola for you, please feel free to contact us. We’ll help answer all of your questions.